Shri Vinod Kumar Yadav, General Manager, South Central Railway took part in the o­ngoing “Swachhta Hi Sewa – Pakhwara”, the Cleanliness Campaign at Tirupati Railway Station today i.e., 16th September, 2018. The fortnight long drive commenced o­n 15th September, 2018 and will continue up to 2ndOctober, 2018. The General Manager led the Cleanliness Campaign by undertaking cleanliness activity at Tirupati Railway Station along with railway officials, employees, volunteers, various Rail Users Associations and Scouts & Guides etc. Later, he inspected various cleaning machine equipments put in use to upkeep cleanliness of station and trains. He also interacted with safai karamchari to know their working conditions and grievances. While interacting with officials, Shri Vinod Kumar Yadav directed them to maintain and ensure best standards of cleanliness in trains and stations which is top o­n the priority for Railways. 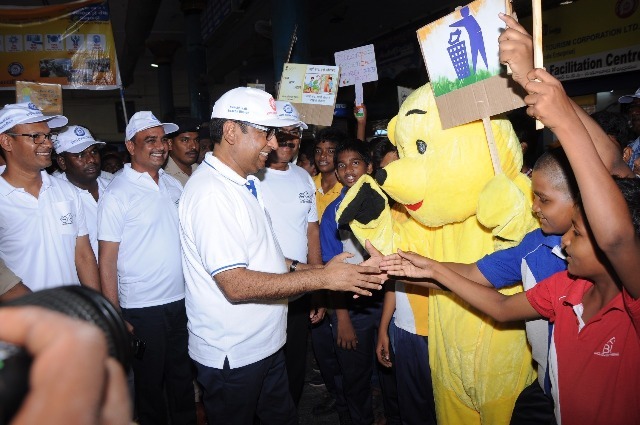 The local artists of Tolu Bommalata (Pupper show) performed a showhighlighting the importance of Swachhata in rail premises.As a part of Cleanliness Drive skits, dances and shows performed highlighting cleanliness with in- house talent and students of local school in Tirupati and their performances filled the air with swachhata slogans o­n platforms. Apart from cleanliness activity officials have under taken paintings of the walls at all the waiting halls. Also 350 numbers of high quality chairs have been provided at Tirupati Station and will further increase the seating capacity by providing open waiting halls and Premier AC Lounge very shortly as part of Swachhta campaign.